Melissa Young doesn’t have to get her shoes muddy or leave her Omaha corporate office job to get farm-fresh produce for her family’s dinner. And Ryan Pekarek, the farmer who grows some of that produce near Dwight, northwest of Lincoln, doesn’t have to deliver his vegetables to Omaha or shop his product around to city dwellers. The farmer and the urban customer connect thanks to Lincoln-based Lone Tree Foods, a middleman business that is bringing a new service to the Omaha market this spring after a competitor, Tomato Tomato, went out of business. Whether Lone Tree succeeds where Tomato Tomato struggled will depend in part on whether there is enough demand from people like Young to cover the higher costs of distributing local foods, a farm economist said. 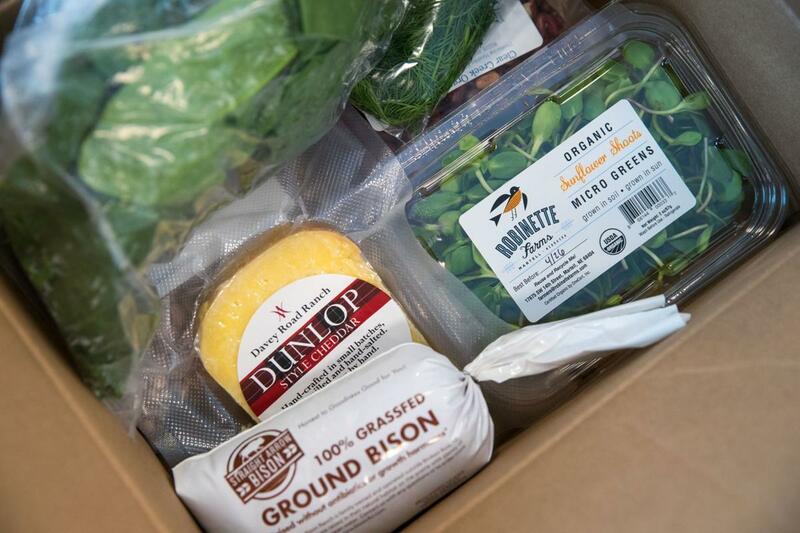 There is also competition from established Omaha providers of “community-supported agriculture” subscription boxes, such as Wenninghoff Farm and Big Muddy Urban Farm. Tomato Tomato closed its west Omaha retail storefront this winter and ended its boxed-vegetable distribution program, which had served employees of several Omaha corporate offices. Owner Michael Kult said he closed the business he’d owned for three years as sales fell due to increasing competition in the local foods market. At the same time, Lone Tree sales manager Erin Schoenberg was looking to expand, and signed up some of Tomato Tomato’s former customers, including Blue Cross Blue Shield of Nebraska, where Young works. Schoenberg and her husband are two of six owners of Lone Tree, which two farmers launched about four years ago as a for-profit business. She declined to share Lone Tree’s revenue figures but said sales nearly doubled in 2016 from 2015, and were up 50 percent in 2017 from 2016. The company expects that fast, early growth to slow, and is now looking to diversify by expanding the subscription box program. Customers have two choices in the program: the veggie share for $25 a week, and the supreme share for $37.50, including meat, cheese and eggs. The boxes are delivered weekly to offices, to stores including the Millard-area Super Saver, and to any other place where at least six customers come together to place an order. Distributors like Lone Tree make local food systems sustainable, said David Swenson, Iowa State University economist. Called “food hubs” in the industry, these distributors make it possible for farmers to achieve the scale to profitably sell a larger amount of produce, meat and dairy products. They expand a farm business beyond the relatively small reach of farmers’ markets and the farmer’s own direct-marketing efforts. Food hubs work in places like Lincoln and Omaha where a concentrated urban population is surrounded by farmland, Swenson said. There is enough demand from people with disposable income, and transportation distances are short enough, that farmers can run a profitable business. A typical Nebraska farmer of field corn and soybeans might need 1,000 acres to be profitable, because of high costs and thin margins, but produce growers like Pekarek need much less. Pekarek said he makes a living, and employs several local people during the growing season, on fewer than 20 acres. He and his wife, a full-time University of Nebraska Extension educator, have four children. Pekarek, one of about 50 growers who distribute through Lone Tree, has been busy this month planting cool-season vegetables like peas and lettuce. He said sales through Lone Tree make up a significant part of his business and supplement sales he makes at area farmers markets and through his own boxed-vegetable share program. Local farmers’ produce can still cost more than the mass-produced fruits and vegetables grown on bigger farms in California, Washington, Texas and Mexico, Swenson said. It costs more because Nebraska-grown spinach, peppers, tomatoes and herbs are typically grown at smaller scale, and picked, packed and transported in a less efficient system than the big supply chains that retailers like Walmart and Costco use. Labor costs can also be higher. So customers like Young have to perceive that local food is worth the cost, that it provides other intangible benefits like freshness and quality, he said. Schoenberg says there’s room to grow and support more farmers if more people would look for and choose locally grown produce. “I don’t think the market is saturated yet,” she said. Blue Cross Blue Shield employees like that the program supports local farmers, said Kathy Nellor, manager of wellness services. It also makes choosing healthful foods easier for them. And Young, the employee, signed up for the box in hopes of enticing her three sons, especially her picky 8-year-old, to eat more vegetables. She said it wasn’t much more expensive than what she’d spend at the store, and was more exciting for her kids. It worked. Their first box earlier this month included pea shoots, which she and her son researched online, finding a recipe for using the greens in a stir-fry with tofu, which her son likes. He helped cook the meal, which their family ate last Saturday. The verdict? “He loved it.” That’s worth the cost.